Once of the biggest complaints from patients is the amount of time they spend waiting. Unfortunately, there's usually no easy fix for this. While reducing the wait time for appointments in your office may not be possible, there are a few things you can do to make the wait itself more bearable (and even enjoyable) for your patients. Make your patients feel at home. Create a relaxed, home-like environment in your waiting room. Furnish the room with comfortable, spacious seating, and make sure the reception area is kept clean at all times. Nowadays, creativity is key. Some clinics have fireplaces and hot beverages available in their waiting rooms, making the wait more pleasant for their patients. Provide up-to-date, relevant reading materials to help patients pass the time. Everyone has been in a waiting room where tables are piled high with outdated magazines. Making sure the literature in your waiting room is current is another simple way to show patients that you value them and know their time is important. It’s also a great opportunity to provide patient education materials. Provide free Wi-Fi and charging stations. Your patients are busy too! 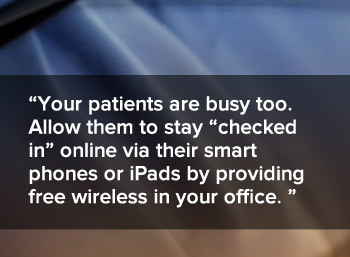 Allow them to stay “checked in” online via their smart phones or tablets by providing free wireless in your office. If they can punch out a quick email, or finally read that article they saved to their favorites, they'll see the waiting time as valuable, rather than inconvenient. Just remind them to be considerate and of the appropriate privacy policies when using any electronic device. Have someone check on your patients. If possible, keep your patients filled in on how much longer they can expect to wait. If they feel they've been waiting too long, they'll start to wonder if they've been forgotten or passed by. Understanding the demographics of your patient base can go a long way - if your patient base includes families, or parents with young children who often come along for the visit, dedicate an area of your waiting room to child-friendly entertainment or activities. Always offer your patients the option to reschedule. If it's obvious to the staff that the wait time will be excessive, be upfront and allow patients to reschedule their appointment. It's a courteous gesture that establishes a relationship of trust and respect. Small improvements can make a world of difference - implementing a few of these tactics can make the wait time more enjoyable for your patients, and less stressful for your staff.